Managing the Union Shop: A guide to supervising and managing employees in a unionized workplace. As a manager or supervisor in a unionized company, you have a unique job. Besides your normal day-to-day responsibilities, you also must know about unions and basic labor law. You can be the best manager in the world, but without a solid knowledge of the rules and responsibilities in a union shop you can get yourself, and your company, into a lot of trouble. That is the purpose of this book - to give you the background you need to be an effective manager in a unionized environment. 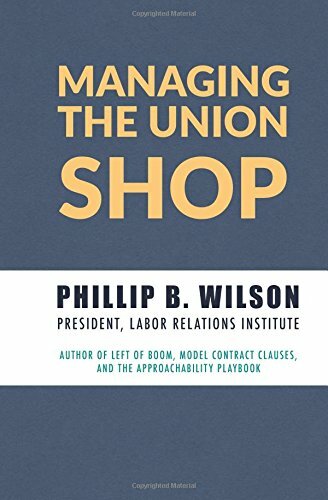 This book walks you through some of the major things you'll need to know about unions to be a good manager or supervisor. By the way, from now on I will refer to management or supervisory employees generically as "managers." No matter what your actual title, all of you share the same job: to manage labor relations in a way that lets your company accomplish its goals with a minimum of trouble from the union. You'll notice that this isn't like most books you've seen on how to be a good manager. First, it looks like a labor contract! For years most contracts have been published as small books, designed to fit in a union steward's shirt pocket. Why? Not just to make it hard to read - although sometimes the fine print can be tough to decipher. No, the reason it is small is so it is portable. Stewards want the contract with them at all times, in case they need it to dispute something that pops up. We've designed this book the same way - you can put it in your pocket and carry it with you. It even has some blank pages in the back so you can use it to take notes. The idea is not for this book to be read once and then thrown in a desk, never to see the light of day. It is a book you can actually use.